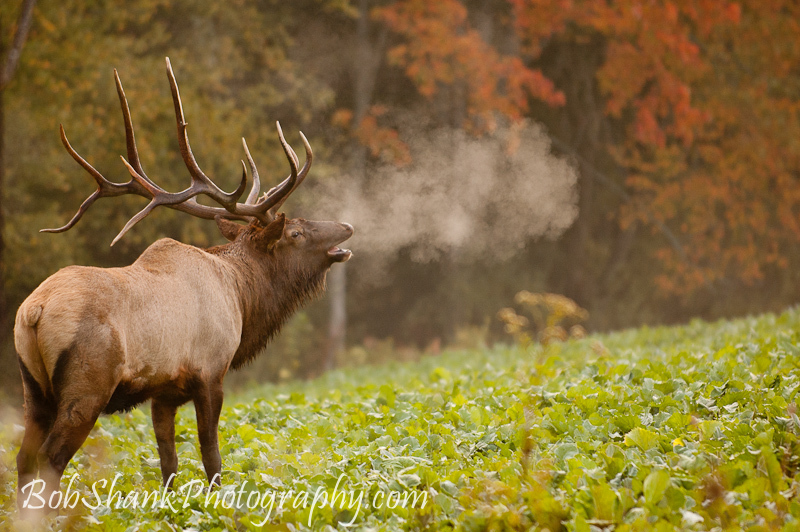 If you ever heard a bull elk bugle in the fall, then these photographs will hopefully illustrate these exciting sounds! The bugle of an eager bull in the rut is an undistinguishable and sometimes ear-piercing sound. 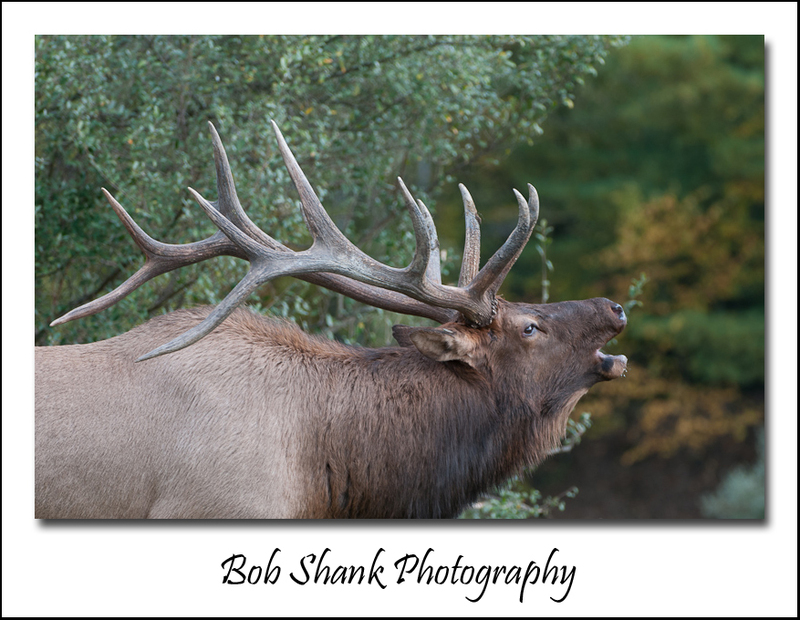 Some people drive many miles just to hear this musical sound of the fall in elk country. A bull will bugle for several reasons. First, he will try to show dominance and intimidate competing bulls for the cows that are ready to be bred. Bulls will answer each other even from hills some distance away just to be heard and remind other bulls that there is already a big bull to contend with on this hill. These competing bugles can be quite a chorus! A second reason a bull will bugle is out of sheer frustration. A bull will follow a cow, hoping for her to be ready, but then be sadly disappointed. As the cow moves away, the bull will bugle in frustration. 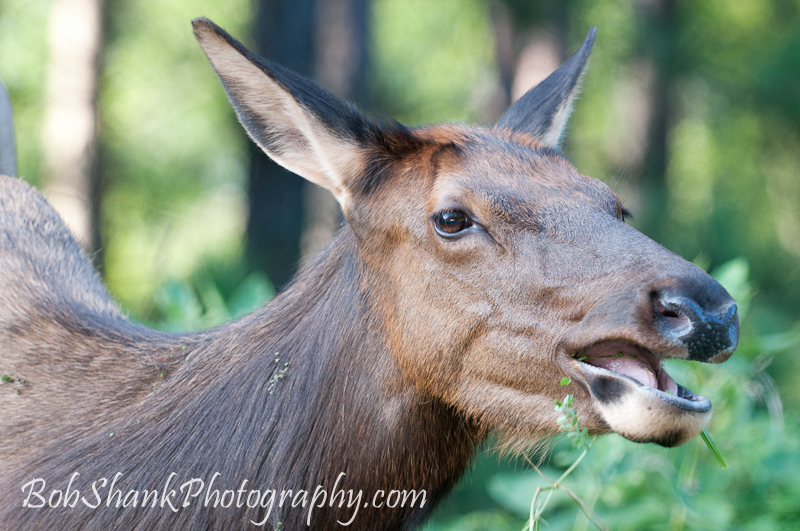 Bugles can be heard any time of day or night. It can be pretty cool, and even a little eerie, to be out on a full moon night and these shrilling sounds! Careful observation and close listening skills can reveal the variety and unique bugles of different bulls. Some are deeper and some are more high-pitched. Still other bugles can be long and drawn out, while others are more short-lived and concise. Each one has an important message! 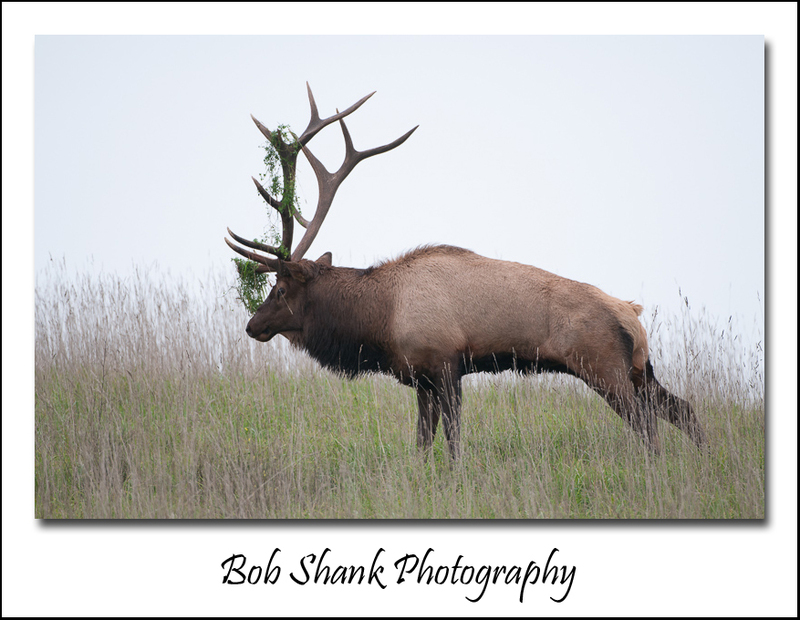 Bugles and bulls come in all sorts and sizes. 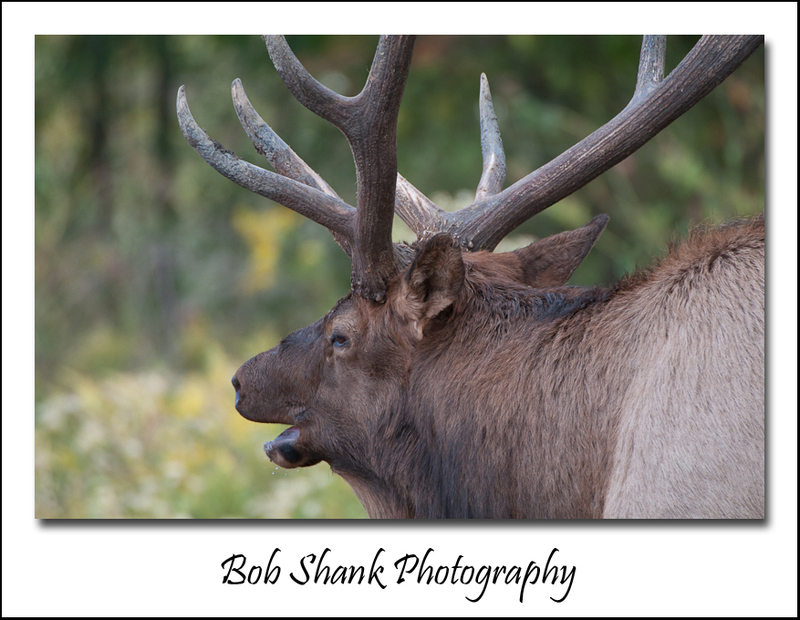 The next time you are out in elk country, listen carefully and listen hard. These unique sounds are sure to bring a smile to your face and perhaps a bit of warmth to your heart. The sound of the bugle indicates the bulls are healthy and active. They have one thing on their mind during the fall season and they are making their presence known–all with the shrilling sound of their bugle! You cannot see it in this photograph, but there is an entire field of cows very close to this bull. The problem for this bull is that none of the cows are ready to mate. So, this bull is frustrated. I’ve watched bulls in the rut for many years now and there is a pattern which repeats itself over and over. A bull will follow a cow, sniffing to see if she is in heat. Typically the cow will trot or run away. This leaves the bull frustrated and almost every single time he will bugle at this exact moment. This is the time to be ready with your camera, which is exactly what I did here in this photograph. 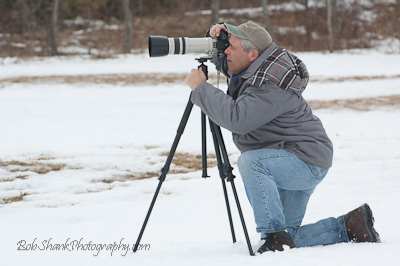 Watching and observing animals is not only enjoyable, it can teach you to be prepared for the best photographic moment! There is nothing quite like an ear-pereicing bugle to roll across a brisk fall day! If you haven’t heard this unique sound in nature, you owe it to yourself to find a way to be in a place where you can hear it. There is nothing in all of nature like it. It is impossible to describe with words and even this photograph cannot even come close to hearing the sound in person. You just have to hear it for yourself! 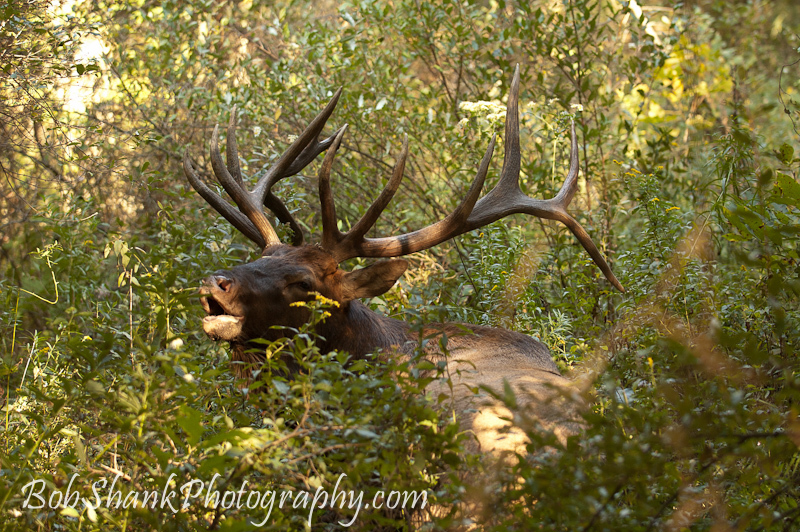 I came across this bull because I first heard him bugling. I was just on my way for a walk, barely out the door, when I heard a bugle. 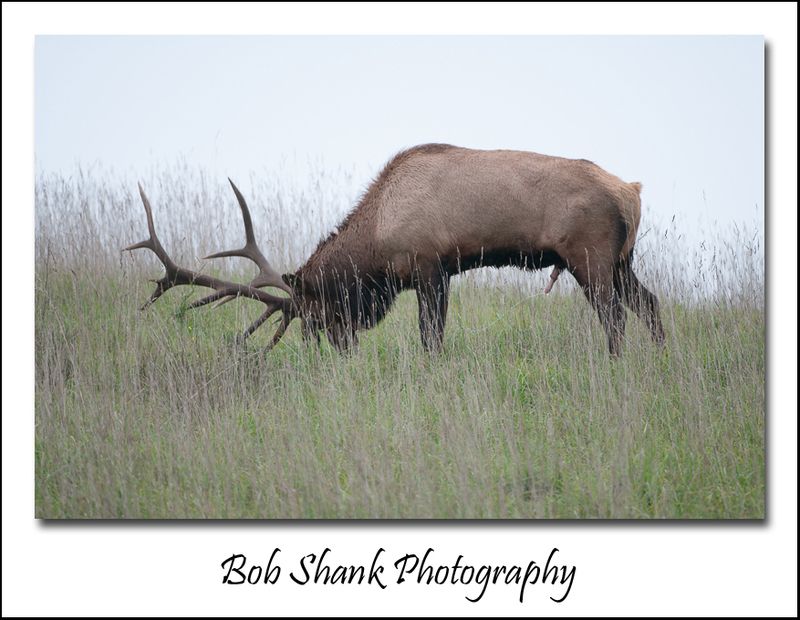 Knowing the area well, I followed the sound and located this bull feeding in a meadow with two cows. It was mid-afternoon on a rainy day but the clouds opened up a little bit and some rays of warm sunlight washed over the scene. It looked magical. Eventually, this bull had enough food in his stomach and he wandered into the woods and laid down to chew his cud. 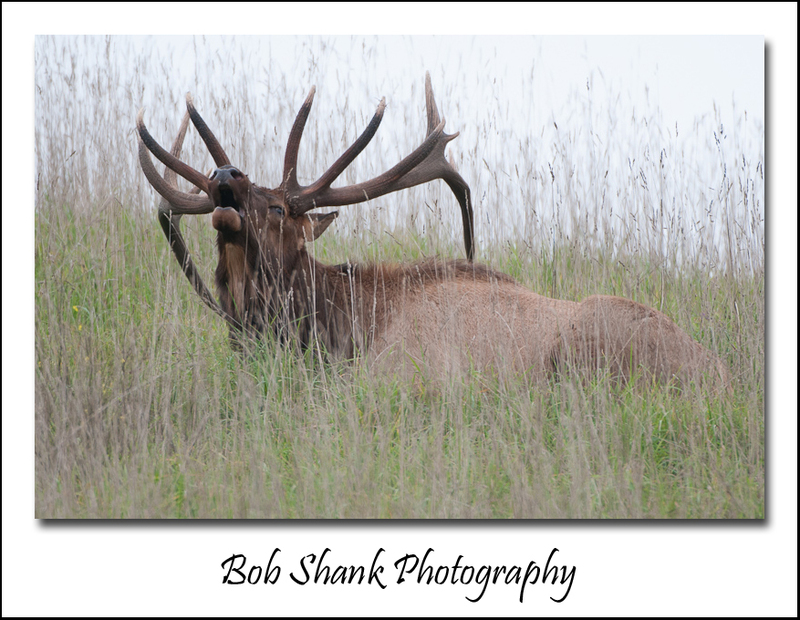 I know enough about wildlife photography to know that spending time with subject is imperative. 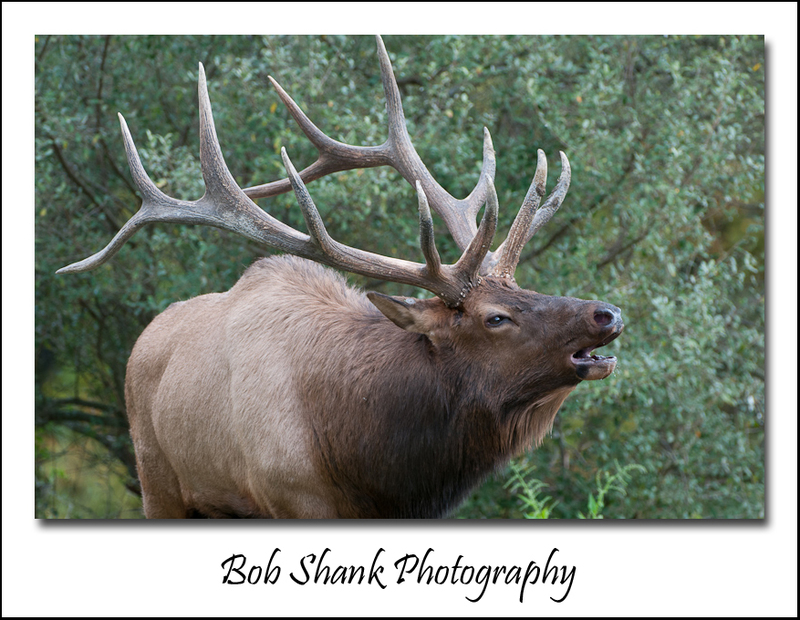 Time, lots of time, is required to completely document and photograph these majestic mammals. In this case, for example, I could have left after the bull wandered out of the warm sunlight washing over the meadow and moved into the much darker woods where many small trees obstructed most clear views of this bull. Move on or stick with him? I chose to stick with him. And this is the photograph I eventually captured. I am very glad I stayed with him! I guess I am a purist of sorts. Perhaps it was the education I received at Temple University when I earned my communications degree back in 1987. I like my photography to depict real-life situations and tell the story exactly as it was seen by me. 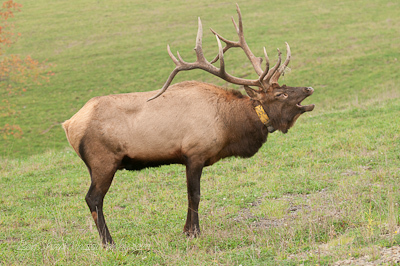 For example, I never use Photoshop to remove a collar from an elk. I know some photographers who do this extremely well and they are definitely better in Photoshop than I. And I don’t knock them for what they do, I just prefer a different route in my own photography I guess. To me there is no right or wrong here–just a preference, and I prefer to keep my photos as they were captured. I do some crop some of my photos once in a while, but to me this is a little different from removing part of an image that is seen as the main subject. Go ahead and call me a purist and I promise not to knock you for removing a collar in Photoshop. 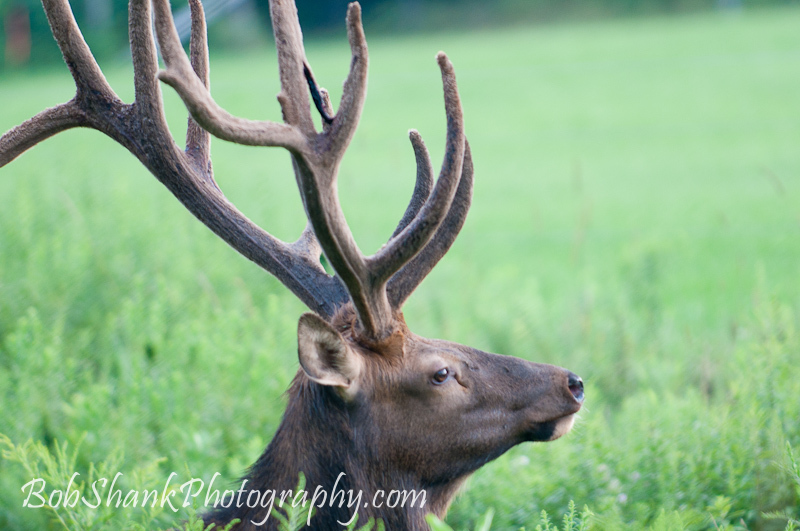 Those of us who photograph the Pennsylvania Elk see these collars often. They are radio transmitters used by the Pennsylvania Game Commission to assist in tracking the elk herd. This research tool is quite helpful I am sure, but as a photographer, I prefer to see elk without the big yellow or brown collars attached to their necks. Again, I am a purist. 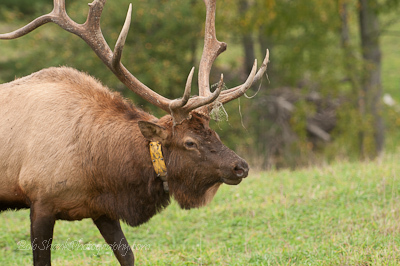 However, the collars some elk wear are part of the elk story and culture on Winslow Hill. 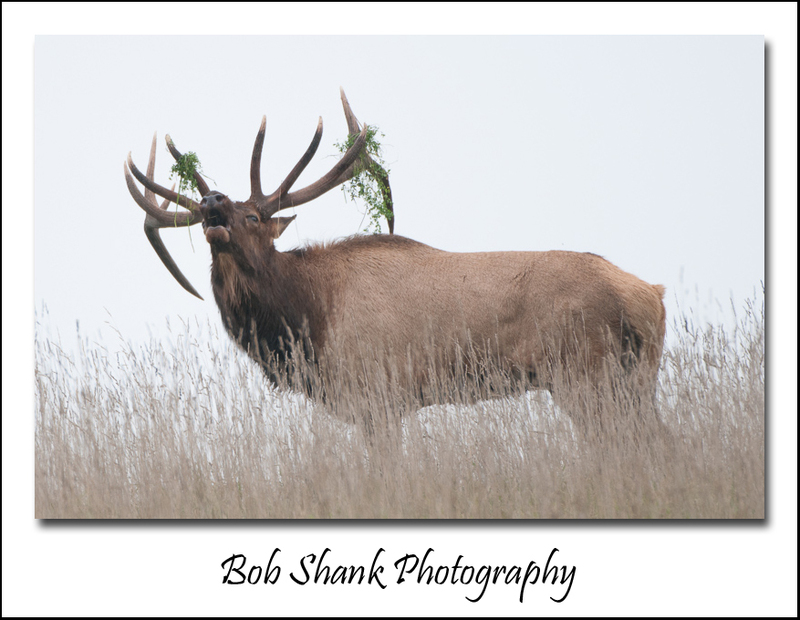 So documenting and even photographing them makes sense to me even though I usually prefer to show only those elk without collars. 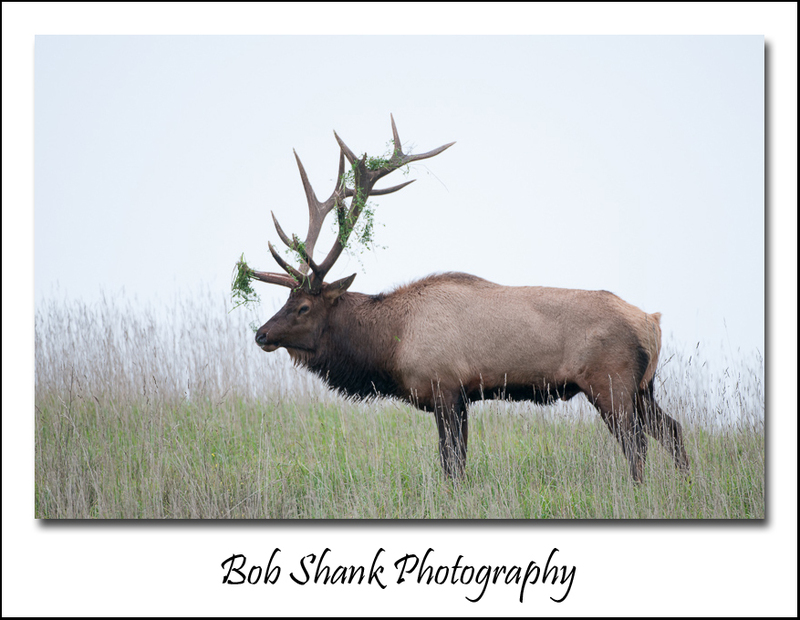 So yesterday, when I saw a blog entry by my photo friend, Brad Myers, and a comment by Coy Hill; I did a little digging. Brad and Coy were discussing the 8A bull, which is a beautiful bull this year! 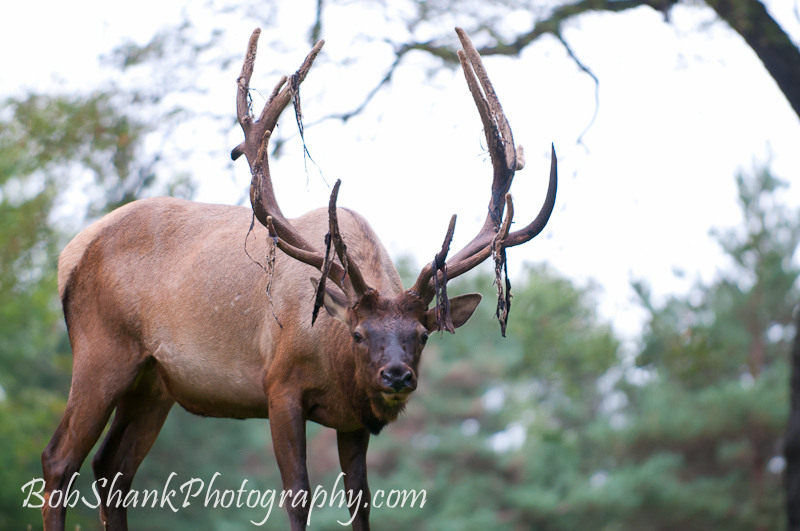 He garnered a lot of attention during the rut. I went back through my photographs and found these photos of the bull known as 8A, since that is the description on his yellow collar. I am kind of embarrassed that I did not post any photos of this bull earlier. And I most likely would not have posted any photos of him without the prompting of Brad’s and Coy’s blog conversation. 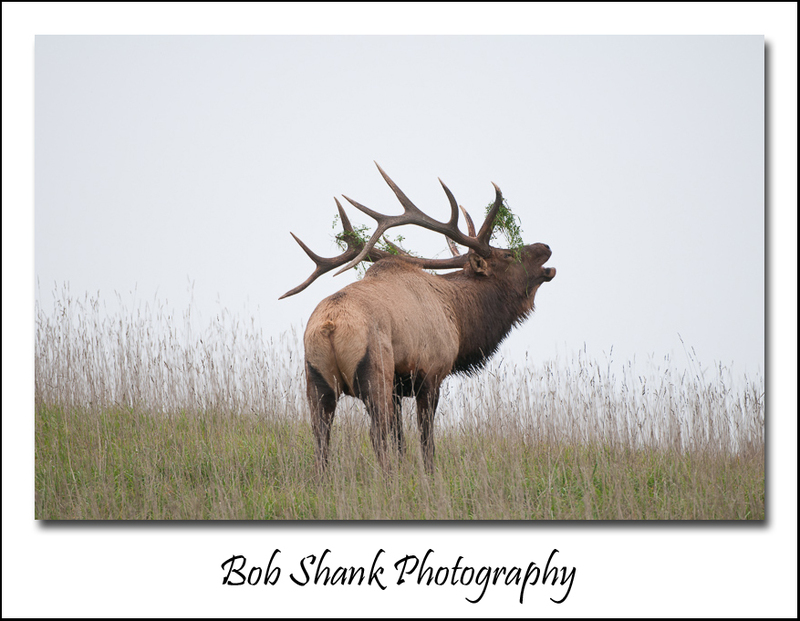 I hope these photos help tell a little more of the Pennsylvania Elk story and help to show just what a magnificent bull is 8A! I like the fall season. I suppose there are many reasons for me preferring this time of year. First, I played football on my high school team, so this time of year always reminds me of that. I just received word last night that one of my coaches, Mr. Kuhnert, died this week. He was also my Earth Science teacher in 9th grade and he was a great teacher and encouraging coach. I will miss him but when the fall season approaches my thoughts always turn to football. Another reason I like fall is because I am a hunter. 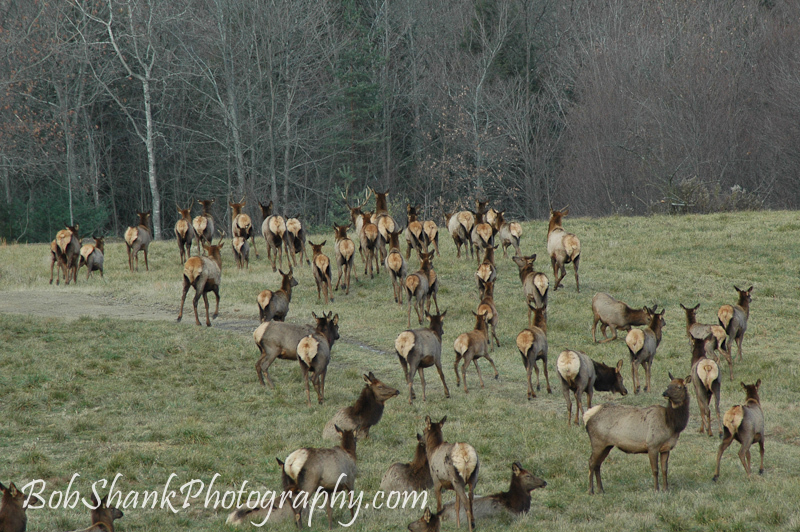 Last, but certainly not least, it is the most active time for the elk. 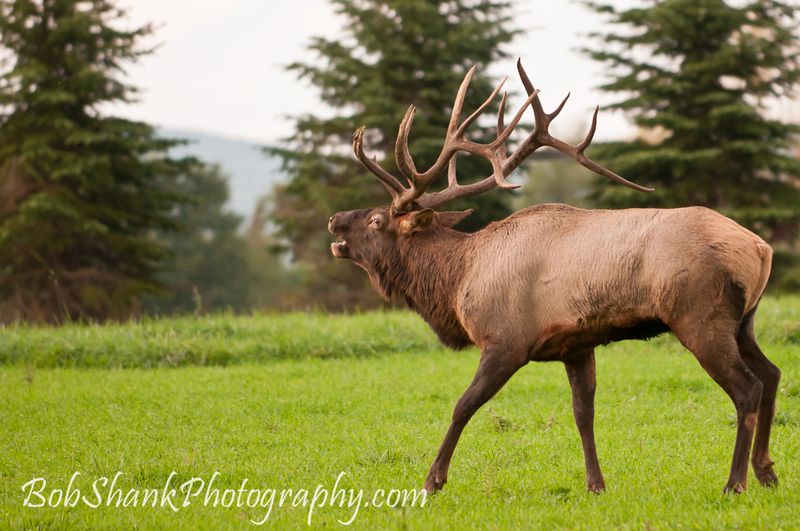 It all starts in September and I cannot wait to get up on the elk range! I posted a photo here today from a trip I was on last fall. 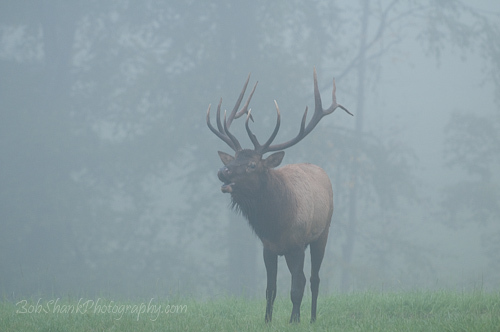 It was a misty, foggy morning but the bull was bugling to beat the band. 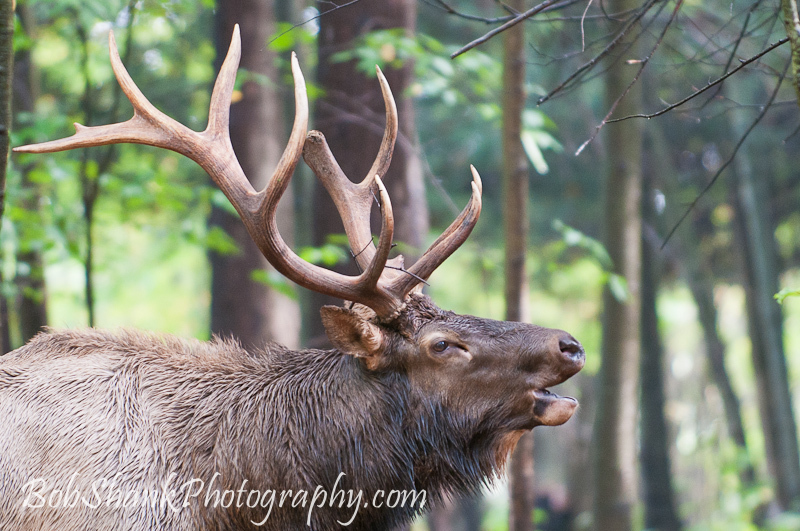 Have you ever heard an elk bugle? 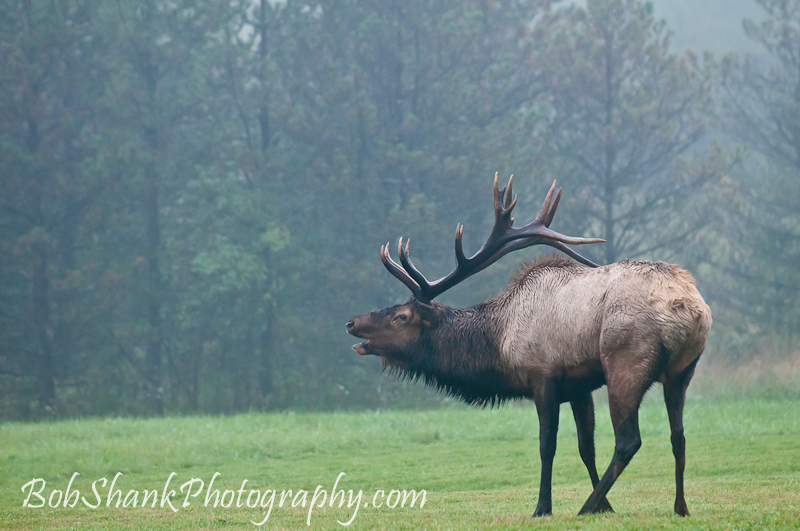 Have you ever watched two bull elk duke it out for breeding rights? These are just the tip of the iceberg sights and sounds that me excited at this time of year. 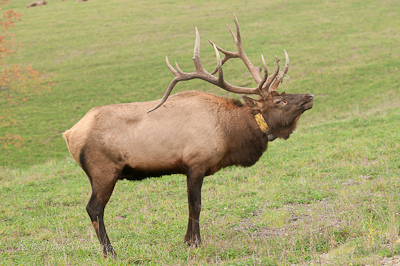 I can’t wait to see the elk in action.